Inspired by the staggering success of his Debt Atrocity Prevention Board, more commonly known as the Bowles-Simpson commission, Obama is again pandering by touting another stalling mechanism he can use to vote present. He’s now promoting his Atrocities Prevention Board, another taxpayer-funded bureaucracy he executive-ordered into existence last August. Like all difficult issues, from study groups in jobs creation to commissions on deficit reduction, the surest sign Obama intends to definitively do nothing on a difficult issue is when he forcefully pens into existence another senior seminar. April 19th was the 237th anniversary of ‘the shot heard round the world’. 75 militiamen stood on the village green in Lexington in defiance of the 700 British regulars bearing down on them. How differently would that day have turned out if instead of marching out to the village green with their rifles, the townsfolk had convened a ‘British Colonial Incursion Prevention Board’? We’d still be toasting the queen. The Obama administration’s new Atrocities Prevention Board will meet for the first time Monday, as President Barack Obama outlines new steps aimed at ensuring the U.S. government has the “mechanisms and structures” to better prevent and respond to mass atrocities and war crimes, a White House official said Sunday. I’d like to put forward an existing ‘mechanism and structure’ to better prevent and respond to mass atrocities and war crimes: The United States military. But even then, any sort of organized response by a nation can affect only another nation. Whereas sanctions and existential threats can put pressure on a central government such as Iran, where is the pressure point for an economically unviable collection of tribes such as Rwanda? And in cases like Sudan, does anyone believe bloodshed will be ended by ousting the current government? The real question: does the existence of the Atrocities Prevention Board concede the inept failure of the United Nations Security Council’s peacekeeping missions and Human Rights Council’s complaint procedures to maintain peace and prevent crimes against humanity? Can we cut money from these failing institutions and reconstitute the money into our own military, the only group that actually ended genocide in the 20th century? Isn’t the following stated intention the purpose of those institutions? 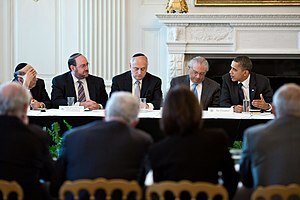 Mr. Obama’s speech is a follow-up on a presidential directive issued last August establishing the board, which aims to develop prevention strategies, ensure that concerns are elevated to senior officials and create a mechanism for the administration to better work with allies to respond to early warning signs from around the world and prevent potential atrocities. In fairness to the Obama administration, it’s not the first to lament the United States’ inability to prevent genocide and ineffectively push to end it. That’s because there are no easy answers. Genocide is the outcome of evil intentions, whether the motivation is racial purity or consolidation of power, and it’s a bloody business ending it. Let’s hope Obama’s latest bureaucratic push for ‘tools and structure’ saves or creates more lives than his similar efforts in jobs and deficit reduction. This entry was posted in Flawed Perspectives and tagged Atrocities Prevention Board, Barack Obama, Bowles-Simpson commission, Iran, Obama, Syria, United Nations Security Council, United States, White House by frick. Bookmark the permalink.